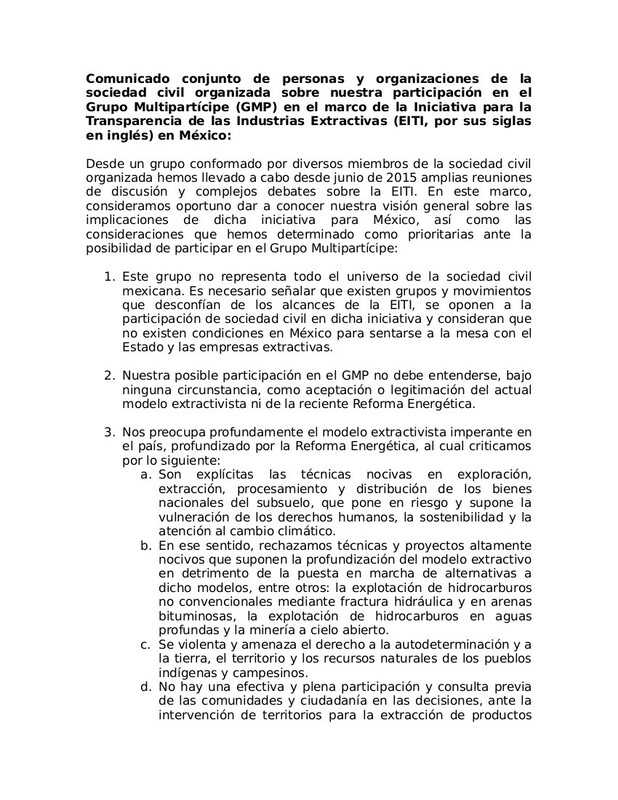 On May 6, 2016, a group of civil society representatives will meet in Mexico’s Energy Ministry (SENER) to begin working towards the installation of the Multi-stakeholder Group of the EITI in Mexico, as we believe that the EITI can be a good opportunity for the country if it explicitly includes social and environmental parameters from a human rights perspective (see attached statement for our list of considerations and priorities). However, if we determine that the conditions for our participation are not possible, we will consider withdrawing from the process. We will be informing the society about the development of this process and the participation of this civil society group as we proceed. Asociación Ecológica Santo Tomás A.C.